Boil water in the outdoors quickly. Any natural fuel can be used, so you don’t have to worry about carrying gas, batteries, or other types of fuel. 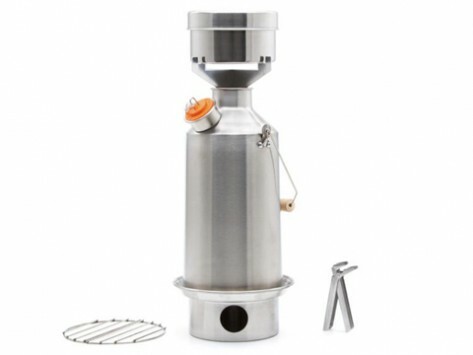 Base Camp set includes Stainless Steel Cook Set and Kelly Kettle. I bought one of these four years ago and have used it extensively. Very easy to use, very quick to boil water and with the stove attachment makes cooking a small meal very easy. It was a lifesaver for myself and my wife when power was lost was four days after a bad ice storm. Be sure to follow the safety directions and only pick up by the chain and handle. Great camping times with this! Quick reliable boiled water with minimal fuel. I have wanted this for years. If you are camping sometimes just having something warm to drink can make the difference in comfort and survival. A great idea never goes out of style, and the Kelly Kettle is a perfect example of well-earned design longevity. It dates back to the 1890s, when Irish anglers and their guides used the Kelly Kettle to boil water for tea. It burns naturally combustible materials for fuel (such as twigs, grass, bark, or pinecones), and it’s remarkably fast, capable of boiling water in just a few minutes, even in extreme weather conditions. The kettle’s efficiency comes from its double-chamber construction. Water sits in the outside chamber, and the fire is contained in the base. The center chamber acts like a chimney, drawing up hot air as the kettle heats, which in turn boils the water. The hot air that escapes out the chimney can also be used to prepare food if you stack Kelly Kettle’s pot support and cooking gear on top of the kettle. Brothers Patrick and Seamus Kelly, the current directors of Kelly Kettle, are the fourth generation of the Kelly family to share their great-grandfather’s invention. Compact and uncomplicated, the Kelly Kettle has earned kudos from outdoor enthusiasts all over the world. It’s ideal for backpackers, campers, kayakers, hunters, and scouts, and it’s also a practical addition to emergency preparedness kits and humanitarian aid packages. We heard about Kelly Kettle from Tiffney Martin, who shared her find on Pinterest. From the shores of Lough Conn, a lake in western Ireland, to the pinboards of Pinterest, it’s a discovery that deserves to be shared.